The latest installation instructions for the supported versions of MCreator are located in the download section of the website. Use these instructions for the legacy reasons only; such as installing an older version of MCreator. Go to the C:/Pylo/MCreator(version) and run MCreator.exe. You might need to run it as administrator if you get stuck on Building forge or if MCreator setup is complete in less than a minute. In such case, remove MCreator, reinstall it and open with admin rights (right click - > Run as admin). For the first time, you might need to allow the firewall to allow Java to access the internet. Setup procedure will start. Wait till it is done (even after you see all ticks, it might take a while before the setup is actually complete) and enjoy using MCreator. You need to have internet access in order to use MCreator. NOTE: You can install MCreator anywhere, but make sure that there are only numbers, English alphabet characters, characters .,-_ and whitespaces in the name of the file path. Other characters from other languages might cause unpredictable errors and problems so avoid them! 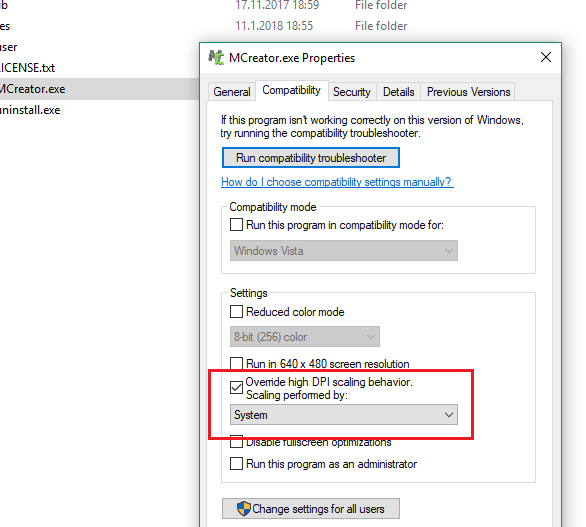 If you have problems with High DPI screens, you can override high DPI scaling behavior and set it to System option. To do so, right-click on MCreator.exe, open Compatibility tab and select options highlighted in the red square. Download MCreator from the MCreator's official website download section. The program is available in two formats: As an Executable (.exe) and as a Compressed Archive (.zip). Use the Compressed Archive if the executable doesn't work. Drag your mouse to the Right bottom corner of the screen. In the Edit Windows, modify PATH by adding the location of Java. If you do not have the item PATH, you may select to add a new variable and add PATH as the name and the location of the class as the value. Select Computer from the Start menu. Choose System Properties from the context menu. Start the previously downloaded installer. If an error occurs during the installation, or the installer simply doesn't work, you may need to download the ZIP archive instead. You also may need to temporarily disable your antivirus/firewall to allow MCreator to download Forge! Install JDK 8 or greater on your Mac. Make sure that your JAVA_HOME environment variable is pointing to Java JDK 8 installation (howto) OR that Java JDK 8 is set as the default Java runtime for launching Java JAR files. Make sure that you have Java 8u172 or higher (but needs to be Java 8) as default Java software. You can do this by typing java -version in the terminal. You also need to have JavaFX installed. If you have Oracle's Java, it is already included in the standard installation. Download MCreator's ZIP file for Mac and Linux and extract it to the preferred folder. We recommend you to use separate folders for each MCreator installation. Click on the MCreator.jar file to run MCreator. Wait until MCreator completes the initial setup. This might take 10 - 20 minutes. If something goes wrong, don't hesitate to contact us to help you fix your bug. Contrary to the Windows version, the OS X version of MCreator doesn't come with JDK, so you need to install it first. To get MCreator for Mac, download the zip version of MCreator from our official website. Install JDK 8 on your computer and set JAVA_HOME variable pointing to the JDK installation directory (which need to be version Java 8u172 or higher but needs to be Java 8). For versions above 1.7.9, make sure to have JavaFX installed. MCreator will warn you if you don't have it. On Ubuntu, you can install it by running sudo apt install openjfx. The installation process may depend on what distribution of Linux you use. This is the most "universal" one we have. Contrary to the Windows version, the Linux version of MCreator doesn't come with JDK, so you need to install it first. Add this line to the ~/.bash_profile: "export JAVA_HOME=(path of your JDK installation)" === for example "export JAVA_HOME=/usr/java/jdk1.5.0_07/bin/java"
Currently, we do not offer support for other operating systems. It should still be possible to run MCreator on other systems that support Java.